"For women who may have taken a break from performing for a variety of reasons, it's this easy opportunity to revive their music," says Maier, who has also established a nonprofit foundation to steer her network of songwriters into educational endeavors. "It's a starting point for students who have never sung with a live band before in front of an audience. It's a place for artists to do material they may not be able to do with their regular band, for whatever reason, or stretch out new material. It can be so many things to so many different people." You're a Lone Voice, Lost in the Roar? It's a few hours before show time at the AlterKnit Lounge, and singer Diana Williamson has just met her band. The husky-voiced Toronto native is leading the attentive players in a rehearsal of one of her earthy, mid-tempo songs, and after a hesitant start, the vocalist and musicians are soon in sync, creating a confident, flavorful groove redolent of Woodstock-era Band and Van Morrison. It's one of the 16 songs these four instrumentalists will learn during the two-plus hours of afternoon rehearsal, an intensive preparation that will afford four women a rare luxury: the chance to put on a quality performance in an established room with a professional band. That's the mission of the monthly concert series known as Chick Singer Night, and Williamson, a first-time participant, is impressed. "Even though L.A. is a big city of musicians, it's hard to find the right guys," says the singer, sitting in the nightclub's restaurant area after her rehearsal. "I think I finally found players. I've never had the right musicians to invite people down to the show. I never felt confident enough before, so this is great." A lot of people--performers and spectators--seem to agree. After a low-key first decade of existence in its Chicago birthplace, Chick Singer Night has recently become a hot franchise. In addition to its Los Angeles staging on the first Monday of each month at the AlterKnit, the Hollywood Knitting Factory's 65-capacity secondary showroom, the event has monthly branches in Chicago, Las Vegas, Nashville and Miami, with a New York edition scheduled to launch Oct. 1. The unlikely overseer of this small empire is Lori Maier, a voice teacher at Pepperdine University with no experience in the music business. Though petite and unassuming, Maier is clearly running the show at the rehearsal, whether sitting quietly and following a song on a page of sheet music, joining the band to sing backup vocals or holding a boombox up to a microphone so the musicians can hear the next song they'll learn. 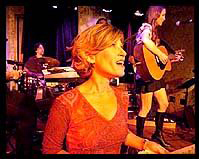 Maier was writing songs and fronting a band in Chicago when she started Chick Singer Night in November 1988. "A lot of friends who would sing backup for me were just kind of curious about how I did it and how I was pulling all these events together," says Maier, 40, during a break from the rehearsal. "I basically did the first one for them. I used my band and wrote up their charts for them and we pulled together this show, and it was such a huge hit that I just kept doing it." Maier and her husband moved to Los Angeles in 1997, and she set up Chick Singer Night last year at the mid-city music bar the Mint, where it ran monthly before moving to the Knitting Factory in June. "It draws a great crowd," says Brian Smith, the Knitting Factory booking assistant who helped bring Chick Singer Night to Hollywood. "They're all just really nice people. There's no rock star thing--it's almost like working-class women who are often overlooked who can come in and show their craft off. It's really about the songs. It brings a nice vibe into the club. It's more of a neighborhood feel." Maier, a mother of two toddlers and a three-days-a-week instructor at Pepperdine, says she listens to 30 to 40 tapes or CDs each week submitted by singers. The candidates range from novices to moderately well-established singers, and while the prospect of being discovered is certainly a lure for many of the performers, Chick Singer Night isn't primarily a talent-scout showcase. Publishing and record company representatives do show up, but the biggest success stories Maier can cite involve work as backup singers for the likes of Don Henley and Stevie Nicks. "For women who may have taken a break from performing for a variety of reasons, it's this easy opportunity to revive their music," says Maier, who has also established a nonprofit foundation to steer her network of songwriters into educational endeavors. "It's a starting point for students who have never sung with a live band before in front of an audience. It's a place for artists to do material they may not be able to do with their regular band, for whatever reason, or stretch out new material. It can be so many things to so many different people." The arrangement with the clubs is the same in all its cities: Chick Singer Night gets the door receipts, which typically cover expenses, chiefly paying the band. The singers don't get paid, but many get an irreplaceable moment. But why chick singers? Don't male musicians also have a hard time catching a break in the music business? "A lot of times the men are in positions of power in this industry," notes Williamson, who co-wrote the recent Sasha Lazard dance-chart hit "Awakening." "So you'll find people don't take you seriously. You want to be taken seriously, so these types of opportunities are very helpful." "For me, it was just closer to home to start a showcase for women," says Maier. "But we have an 'Are you man enough?' slot for the guys if they want to come sing with us."